 My feet hurt from working all day and I wish I wasn’t wearing these heels! I don’t want to ruin my fancy shoes walking home from the bar! My ski boots/snowboarding boots kill my feet and I wish I had a little pair of shoes to wear around the lodge! I have to go straight from the beach to an event and can’t wear my flip flops! Dancing all evening was not good for my feet! I need to get out of these heels asap! If you are a woman you can definitely relate to one of the above… and many more. I know I have been caught many times with painful feet and a strong desire for a pair of flats immediately. I was sent a few pairs of Delicate Soles to test out for the owners, and I can tell you first hand these shoes are amazing. Delicate Soles are very thin ballet flats that fit in any purse- rolled up they are smaller than my cell phone. They are so comfortable, and I really enjoy wearing them after a night on the town, or more recently, when hanging around the mountain. When I lived in Florence I used to carry a pair of big, bulky flip flops to change into at the end of a night of dancing. With Delicate Soles, you don’t need to do that! Simply tuck the shoes in their little tote in your purse, and tuck the extra tote in as well. When the night is over, switch shoes and put your heels in the extra tote they provide! The company really did think of everything. style wherever you may roam. strenuous stilettos when your feet have had enough. keep our costs reasonable without sacrificing quality. like leather, but without the added weight. Visit delicatesoles.com and come back here to leave me a comment letting me know which color you want. Leave a comment telling me why you need a pair of these! Real stories appreciated! Mention this giveaway and link back to it on your blogs, Facebook page, or Twitter (be sure to @rhodeygirltests in the Tweet). Each one of this options will gain you an entry. The giveaway will close March 5th at 10 AM, and winners will be announced that day. Good Luck!!!! *Please be sure to update your Google Readers to www.rhodeygirltests.com/feed. Also, the right column will always list the 5 most recent posts in case you need to catch up! **My new blog design was created with the help of Jenn of www.j3nn.net (who helped me switch servers) and Cory of Zesty Blog Consulting (who did the actual design changes). I have imagined what I wanted my site to look like for a long time now, and I am happy to say that has finally been realized. Thank you Jenn & Cory! Pixie Dust! Baby pink is my favorite color. What a great idea. These are such a great idea. I’m a musician and I like to wear heels to look professional for concerts, but that is way to much heel-wearing for my poor feet. If I had a pair of these I would wear them to and from the concerts every time. For orchestra, I’d like the onyx pair. Wearing 4″ heels on the daily has been the norm for me since I was a teen. However, moving to Manayunk and running around in 4″ heels is not always an option and the cobblestones and stilettos after a night out – hello, a gal needs flats that can fit in a cute bag. And the Onyx color – so chic! I love the lipstick red delicate soles shoes. They are so pretty! Thanks for the giveaway! I live in Wyoming, so right now, I couldn’t really wear these home walking home on a night out (the snow is still two feet deep some places!). However, I would LOVE these for cold nights relaxing at home either at my own house or at my sister’s or my parent’s in front of their fire places. They seem PERFECT for that! Love the silver color and have been looking for something like this forever. Love them! Love the silver ones! I am going online to buy a pair for my mom right now- thank you so much for the intro to them. If I do not win, I will surely buy a pair.My feet are always killing me after a long day standing at work. I love your new blog — looks GREAT! I would love the onyx pair – I’ve been looking for a new pair of black flats and these seem perfect! I need a pair of delicate soles because I recently purchased a pair of high heeled leopard print mary janes but they’re closer to torture devices than footwear. Delicate Soles sounds like they would solve the problem after I wear the heels for a few hours! These look like the perfect flat for a quiet evening when you still want to look cute! I think their permanent home will be my handbag though! I can always use a pair of flats after a day in heels! Great giveaway! I’d pick the color: pixie dust. 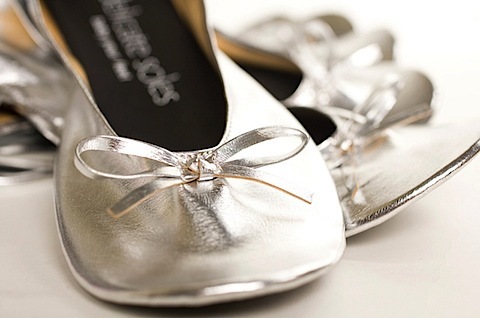 After being on my feet all day at work I would love a pair of the silver flats! I am 23 and 7 months pregnant with my first little munchkin…there are very few things I feel safe to wear in this PA mountain weather, that are also stylish, that are also comfy! These look adorable. Starlight Silver looks so pretty! How lovely! I love Onyx. I am headed back to work after several months of being an at-home mom, and know these would come in handy! as a wedding photographer, I like to wear heels when shooting a wedding, foolish I know, but by the middle of the reception my feet are killing me. Sometimes I am on my feet for 16 hours…my heels (and toes) were not made for that! I love the silver pair! I’m glad you gave these a thumbs up…I am considering getting a few pairs for my bridesmaids and wanted to make sure they were awesome, and your blog showed up in my search. These are so cute!!! I love the silver in small. I’m thinking I could use them with my bridesmaid dress for my friends wedding this July. What a great gift. The best part is that part of the proceeds go toward charity.